Mundosparalelos Information Dance Plymouth Pole Pole Dancing and The Pope. Pole Dancing and The Pope. My fitness is certainly being boosted by the increase in hours teaching and the many pending pole dancing performances also look set to either boost my health further or result in me needing to lie down for 2 days! After the successful re-launch last Saturday we started our week of themed pole dancing classes to give fitness pole an extra element of fun. The week included a Black rock theme, Sparkly inverts, Pink Ladies spins master class (see picture below) and my 80's spinning pole dance class (see picture above). The classes have been such a success that we now plan to make it a monthly feature. The 80's classes were such fun to teach as I blasted out classics such as Madonna 'Like a Virgin, Taylor Dane 'Tell it to my heart' and Cyndi Lauper 'Girls just want to have fun'. Thankfully despite the spinning poles, no one was sick and everyone made some fantastic pole dancing progress. Aside from the constant singing, dancing and laughter there was some serious hard work going on (doing a seated climb on a spinning pole is no mean feat). Next week I will be taking pole dancing to a new audience as I perform at the Protest the Pope debate at Raffles. The debate has been organised by my husband who is chair of the Plymouth Humanists and looks set to attract a large audience and I can't wait to get involved with the debate which will be held on Wednesday 15th April. From a personal standpoint I don't believe that UK tax-payers should be paying for the Pope's visit for 2 reasons; Firstly due to the Pope's cover up of child abuse within the Catholic Church and secondly because I don't see why, in a time of economic difficulty, we can justify spending millions of pounds on bringing a very wealthy religious leader to UK soil. Surely the Vatican should be funding this visit and not us. It seems like yet another example that our government is not listening to the needs of the people. 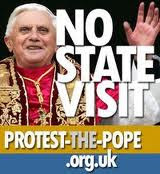 It is just non-Catholics who don't agree with the visit and many Catholics are shunning the £25 ticket prices that would give them the opportunity to meet Pope Benedict. Click here to read a recent BBC news article. Further irony can be found in the many UK schools bus-loading kids to see a man who covers up child abuse, click here for the Herald story on a Plymouth schools planned visit. Anyway, I will let you know how the debate goes next week as well as updating you on the planned Plymouth Protest against the Pope scheduled for Sunday 19th September and departing at 5.30pm from the Natwest Building at the top of Royal Parade and then ending at the Cathedral Church of St Mary and St Boniface, 45 Cecil Street. We will gather for a protest outside the Cathedral. All are welcome. Prior to the Pope Demonstration I will be taking part in a pole dancing performance alongside fellow art of dance pole dancing instructors Rosanna Durban and Tamar Preston at the Union Street Family Fun day to be held on Sunday 19th September. We will be pole dancing in front of a fire engine which should be fun. (full details to follow). On the 24th September you can catch Tamar and I pole dancing at the Tenpin bowling Ladies night (full details to follow). On the 25th and 26th September I will be dancing at this years Tavisrock Festival at the Wharf, one of Devon's premier music venues. The event is in it's third year and is the brainchild of local promoter Ellie Hudson - click here for more details on the Festival and the amazing line-up.